A group of hackers calling themselves the “Al-Qaeda Hackers Team”, has hacked and defaced the official website of the Town of Wanatah, Indiana, US (wanatah-in.gov), Cyber News reports. 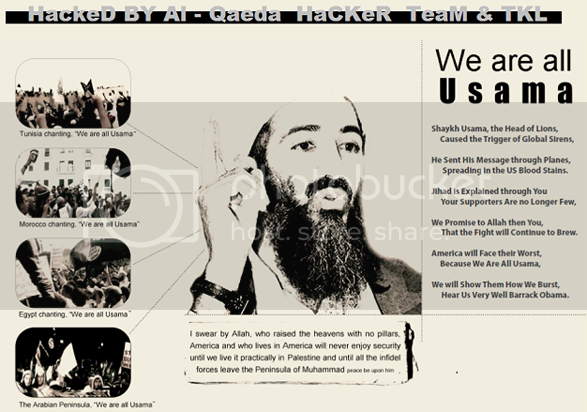 Al-Qaeda Hackers Team wrote the following words on defaced site under a picture of Osama bin Laden. This Al-Qaeda Hackers Team group is probably not officially linked to Al-Qaeda. This incident shows that the militant Islamist organization has numerous supporters willing to aid their cause. Also checkout Top 5 Osama Bin Laden Wallpapers. Bin Laden was born to the family of billionaire Mohammed bin Awad bin Laden in Saudi Arabia. He studied at university in the country until 1979, when he joined mujahideen forces in Pakistan fighting against the Soviet Union in Afghanistan. He helped to fund the mujahideen by funneling arms, money and fighters from the Arab world into Afghanistan, and gained popularity among many Arabs. In 1988, he formed al-Qaeda. He was banished from Saudi Arabia in 1992, and shifted his base to Sudan, until U.S. pressure forced him to leave Sudan in 1996. After establishing a new base in Afghanistan, he declared a war against the United States, initiating a series of bombings and related attacks. Osama bin Laden was killed in Abbottabad, Pakistan on May 2, 2011, shortly after 1:00 am local time by a United States special forces military unit. The operation, code-named Operation Neptune Spear, was ordered by United States President Barack Obama and carried out in a U.S. Central Intelligence Agency (CIA) operation by a team of United States Navy SEALs from the United States Naval Special Warfare Development Group(also known as DEVGRU or informally by its former name, SEAL Team Six) of the Joint Special Operations Command, with support from CIA operatives on the ground. The raid on bin Laden’s compound in Abbottabad was launched from Afghanistan. After the raid, reports at the time stated that U.S. forces had taken bin Laden’s body to Afghanistan for identification, then buried it at sea within 24 hours of his death.